Kantaifi or sometimes written kataifi, is pronounced ka-ta-I-fee (without the n) and it is a kind of phyllo made of strands. The dough which is in the form of batter, passes from a machine with fine holes and while the batter comes out of the holes on a heated rotating plate it is cooked and dried at the same time and the batter takes the form of long strands. When I started blogging seven years ago, I never believed that it would last so long. It is characteristic of those born under the Aries zodiac sign that we get very enthusiastic when we start a new project but we tend to lose interest and give up easily. Personally, I am surprised that I am still blogging but the fact that I am creating something different every times it what is keeping me interested. There are times that I want to give up and start another project, which I do occationally, but have not given up on my blog yet. For example, I am now working on a Greek charity book whilst blogging in a slower pace. It may not be as often as I did during the first years, mainly because the social media are now taking a lot of our time, but I try hard to keep the blog alive by posting at least two or three times a month. At the beginning of the month my daughter visited us and I tried to make all her favourite food. One of them was a “Tyropita with Kataifi” which I made with feta and mozarella. I did not want to make all the kataifi into one huge tyropita as I was also making Dolmades, Koupes and grilled Corn on the Cob as well as grilled halloumi, so I made a smaller one, using half the packet. Kantaifi is sold frozen, so once thawed it has to be used during the next few days. Since I did not have any nuts, I decided to improvise and use some semolina to make the galaktoboureko filling. If I had nuts, I would have made the classic kantaifi recipe, filled with nuts and cinnamon, which I have not made for a very long time and just realized that I have never posted that recipe yet! However, the recipe is included in my cookbook “Traditional Greek Desserts“, which you can download for free by subscribing to my newsletter. Many of you may not know how “kantaifi” is made, so you may watch this video to see how it is made. The strands of kantaifi are pressed to each other, when packed, so before making the dessert, you have to fluff it up by just pulling the strands. Like other kinds of phyllo, if exposed to air for a long time, it will dry out, so when preparing it during hot weather, keep it covered with a napkin or cling film. Kantaifi is available from Greek, other Middle Eastern and Mediterranean food shops. Instead of making some syrup from scratch, I had some leftover syrup from watermelon rind preserve which was already infused in cinnamon, cloves and fragrant geranium and that alone added an amazing flavour to the dessert. However, you can make the syrup from scratch, as per the recipe. We had a lot of fun during her stay. We spent one day visiting Bourdji, which is the landmark of Nafplion and another climbing up the hill which is the landmark of our village, Profitis Elias. You can see more pictures and many historical facts about Bourdji as well as the amazing view from the top of Profitis Elias of Assini, in my other blog. Begin by preparing the syrup first so that it is not too hot when galaktompoureko nests are baked. Put the sugar, water, lemon peel, rose geranium leaves and spices in a small pot. Bring to a boil and simmer for 5 minutes. Mix in lemon juice and remove from the heat. In a small pot, heat the milk with half the sugar and lemon zest. Turn off the heat and add the vanilla essence. In a larger pot put the eggs with remaining sugar and lemon zest and whisk the eggs until the mixture is creamy. Add the hot milk and continue whisking so that the eggs do not curdle. Add the semolina and continue whisking until the cream sets. Mix in butter and set the cream aside to cool. While it is cooling, butter the muffin tins well with the remaining butter. Fluff the kantaifi and put some in the muffin tins, reserving a small amount (about ¼) to use on top. Make sure to cover the base and sides with the kantaifi. Press it with something, such as a glass, which fits in the muffin tin, so as to give it some shape. 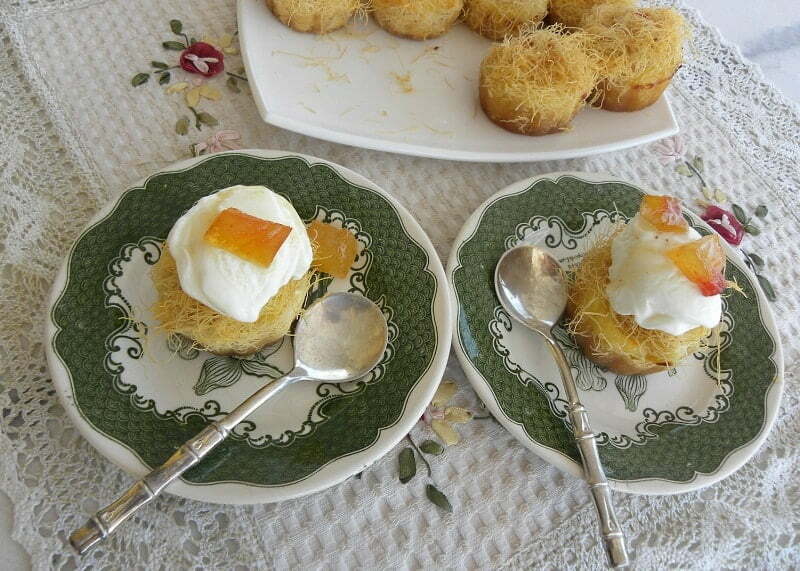 Fill the kantaifi nests with the galaktoboureko cream and add some kantaifi on top. Melt some butter and drizzle a teaspoon on top of each. Preheat the oven to 180o C and bake them at until golden (about half an hour). Using a spoon, pour spoonfuls of syrup on each nest to wet them well. When they cool, remove them from the muffin tins and store in the refrigerator. As an extra treat, serve it with kaimaki (or other) ice cream and watermelon rind preserve on top! Happy 7th Bloganniversary and to many more! What a milestone. Those kantaifi with pudding cream look scrumptious. Galaktoboureko in Kataifi Nests! Such an awesome preparation. I am going to try this out in my home. A lovely post, Ivy! And all the details – thank you for that!